COMMENTS: So many times in this season I've felt that Claire was a minute away from leaving Frank and we had another example in this episode. I really hope something of this happens in the final episode or it will have felt like a gigantic waste of time. But it does highlight the theme of this episode and indeed the season. It's all about love. Not the marriage of Claire and Frank but the marriage of Doug and Frank. The loyalty he shows comes close to psychopathic. But one question - how come burning the journal didn't set off any fire alarms in the Oval Office?! PLOT SUMMARY: Seth Grayson tells Frank he should be Remy Danton's replacement as Chief of Staff. 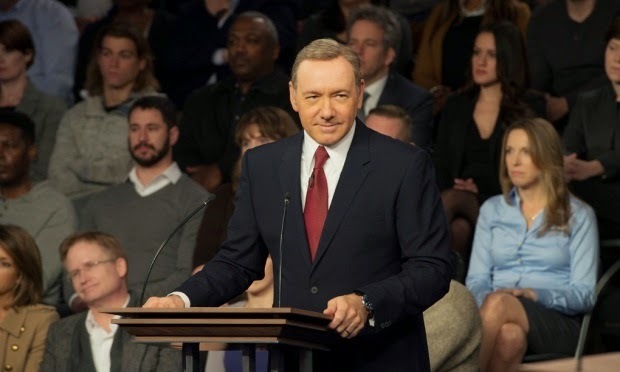 Frank pushes Claire into the limelight on the campaign trail as she's got better ratings than he has. Supreme Court Justice Jacobs is now ready to retire and offers his seat to Dunbar - he argues that she would have more lasting impact in the Court. Frank and Claire react to Tom Wates' scornful first chapter of the proposed biography. He wants to write a book about the marriage, Frank refuses & threatens to reveal that Tom didn't write his first book. Kate Baldwin has gotten hold of the mourning letter that Frank sent to the parents of the Navy SEAL who died on the covert Jordan Valley mission. Tom gives the chapter to Kate and she gasps at his naivety in thinking Frank would publish it and tells him to drop the project, to his disgust. Remy refuses a job with Jackie & also refuses to give her dirt on Claire for Dunbar's campaign. He later refuses Jackie's advances only to give in a moment later. In desperation, Dunbar offers to buy dirt from Doug Stamper. He clearly complies because Dunbar threatens to reveal that Claire lied about the abortion on TV unless Frank pulls out of the race. Frank bluffs it out to her, and to camera says he'll kill her if she goes after Claire. Claire meets with a voter who comments candidly on her and her husband's infidelity and her wish for a divorce. Straight afterward, Frank calls Claire home and Meechum delivers Doug to the Oval Office. He claims that Dunbar doesn't have the journal, he just told her about it to appear credible, and dramatically burns it in front of Frank. Stamper is re-appointed as Frank's Chief of Staff and Dunbar knows she's been double-crossed. Claire is angry that she wasn't consulted.